You know when you buy a product and it completely lives up to your expectations and more? This is one of them! The OCC liptars are one of those products I've been meaning to try for ages. They are one of those Youtube Guru cult products that they always seem to rave about but because they arent readily available I tend to not think about purchasing them. I bought two at IMATS after being hypnotized by the huge shade range. I chose two fairly "normal shades", but OCC has a whopping 36 shades ranging from white to orange to bright blue. They can be mixed to create a plethora of different lip colours. Anime Lip Tar is described as a"seriously neon pink" and its truly that. 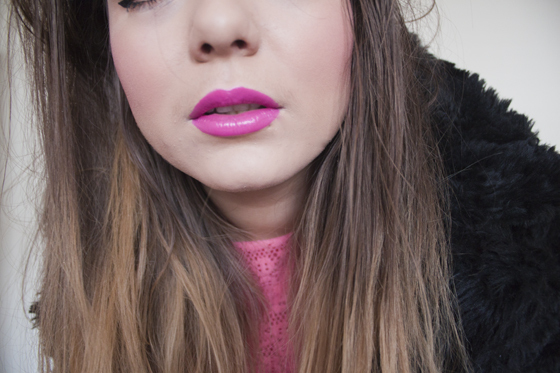 Bright, shocking and full on, perfect for a night out or a big statement lip. The formula of a OCC Lip Tar is very smooth and pigmented, they leave a semi matte, but also has a nice sheen finish on the lips. They have a sort of satin feel to wear on the lips. 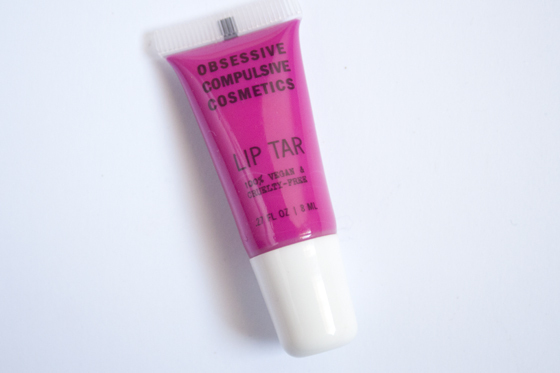 OCC Lip Tars are mint scented, which is non offensive if your sensitive to scented products (like me!). OCC Lip Tar in Anime isn't drying, but I found when I wore it for a whole day my lips did start to feel a toucht dryer, but nothing that a dab of lip balm couldn't sort out. Anime did bleed slightly, but this could be rectified with a lip liner (I used a cheap one from NYX in Dolly Pink). You do really need the tiniest dot to cover your whole lips, Using a lip brush really helps with precise application. If you apply too much it can feel a bit tacky, so less is definitely more in this case! I found Anime did stain my lips a bit but came straight off with makeup remover. These come highly recommended by me and I will certainly be purchasing a few more in the future. At £8.99 they are on the pricey side, However I think they are 100% worth investing in. They are miles ahead of the Sleek Pout Paints, which personally I dont even think they are comparable (I thought were terrible). They provide opaque long wearing coverage without drying. 10/10 from me! Gorgeous colour. Apologies about my post yesterday - it sounded so snarky which wasn't my intention at all, I love your site. So gorgeous, and I'm so mad I didn't go and pick up OCC at IMATs now! Woah, such a bright colour, it's lovely! Ooh, so bright! (But then and again bright colours REALLY suit you!) It looks really good! this colour is so lovely! I really wish I had picked up more than 1 at IMATS, and this shade has gone right on my wish list! I cannot wait until payday - going to be purchasing some Lip Tar for myself!